Most of us know that a forest is a "large, densely wooded area" full of trees and plants not to mention a whole world of insects and animals. However, if we were to ask the question as to what types of animals dwelt in the forest, we might be hard pressed to give a correct answer. Bears, perhaps? Or skunks, maybe? Do lions live in the forest or was that just a part of a make-believe children's story book? What kinds of animals really do call the forest their home? A relatively temperate forest full of deciduous trees is quite different from a rain forest and houses different types of animals. Typical mammals found in this type of forest include the black bear, white-tailed deer, raccoon,coyote, grey squirrel, chipmunk, and other small rodents. Many different types of birds are also found in the temperate, deciduous forest including the Cardinal, Turkey, Eagle, and Goshawk among others. Different types of snakes can be found in temperate forests such as the Garter Snake or the Rat Snake. If there is nearby water, various types of toads, lizards, and frogs might be seen around as well. Insects of all types love the forest including bumblebees, spiders, and mosquitoes. Forest animals vary from area to area. Forest animals in the southern hemisphere are quite different than those in the northern. 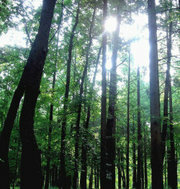 Even forests on the west and east coasts of the United States vary in habitants. The different temperatures, climate changes, and tree coverings attract different types of animals, but this is the general overview of animals living in a temperate, deciduous forest.